March 27, 2018 in NOVELTY. February 22, 2018 in NOVELTY. This Superman bust bank was sold exclusively at the Warner Bros. Studio Store back in 1997. One of the many products promoting Superman: The Animated Series, this bank stands at eight and a half inches tall, is made of vinyl, and depicts Superman in his often seen act of breaking chains. October 11, 2017 in NOVELTY. Monogram has been licensed by DC Comics to create banks for several years. This is a New 52 Superman bust bank from 2013 and is made of plastic. 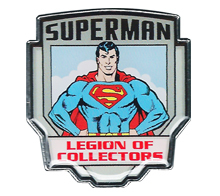 It features a 3-D look at the Jim Lee designed New 52 version of Superman complete with the black ’S’ symbol on his cape. September 18, 2017 in NOVELTY. February 1, 2016 in NOVELTY. September 6, 2015 in NOVELTY.